Frameworks give us a set of tools to build our web application on top of. These technical tools are packaged together to make a framework for open-source rapid web development in PHP language. PHP is indeed blessed with some great open-source web development Frameworks. And we are not able to talk about Zend, Phalcon, Fat-free or FuelPHP. All great frameworks in their own right. However, we simply do not have the background knowledge to discuss. All these frameworks are built on MVC (model-view-controller) architecture. The tools such as following are available out-of-the-box with most web Frameworks. Here we’ll discuss and compare the famous PHP frameworks for their ability against each other. For ease of use, we’ll discuss these frameworks one by one. We’ll later on add more frameworks as we go along to make the PHP framework comparison. We are only adding frameworks which we work with and support for our clients. We will give points to each framework for their performance in a certain aspect. We’ll add more points of discussion in further iterations. So here we start with PHP framework comparison one by one. CodeIgniter was the original PHP framework. Developed in 2006, it’s been here forever. Its development got slower citing lack of resources for active development. It got stuck in 2.x for a long time but enter latest 3.x in 2015. CodeIgniter is mostly popular in South Asian web developers. The Right Software have developed a number of accomplished PHP projects in CodeIgniter and have an expert CodeIgniter development services team. We are also able to help update novelty, out of date CodeIgniter websites to make them up to date with latest framework version or to convert them into other latest frameworks. Laravel framework is the most popular right now. The first version came out in 2011 so it is relatively a new framework considering that most of PHP frameworks started out in 2011. However, that hasn’t stopped Laravel framework from taking over the PHP web development scene. Laravel is currently on 5.4 version however there are many websites still in Laravel 4 as the jump is a bit steep and manual porting of the code is required. Laravel is most popular in web developers from the 1st world countries such as US, Canada and Europe. Laravel is the most popular PHP framework and is here to stay. The Right Software team prefer Laravel framework web development and help our clients by building the code in Laravel. Yii is a popular framework for web developers from China and Russian block mainly. Yii came about in 2006 from PRADO framework; it followed CodeIgniter in that it remained stuck in 1.0 and 1.1 for a long time until 2014 when the initial mistakes were fixed and a 2.0 was launched. That was when it touched its peak popularity. It’s been slow and downward curve since then. Yii is still on 2.0.x. Yii Framework is a good choice if you have clients from China or Russia and they require you to update Yii applications to latest versions. CakePHP framework was one of the original offenders. It came about in 2005 even before CodeIgniter. CakePHP reached peak popularity in 2009 even before its popular version 2.0 release in 2011. It has been a downward journey ever since. Still it is on a respectable version 3.4 and a middling yet solid choice among PHP Frameworks. There are plenty of CakePHP development projects that need updates and modernization. CakePHP has been popular in Bangladesh most of all places followed by Japan. 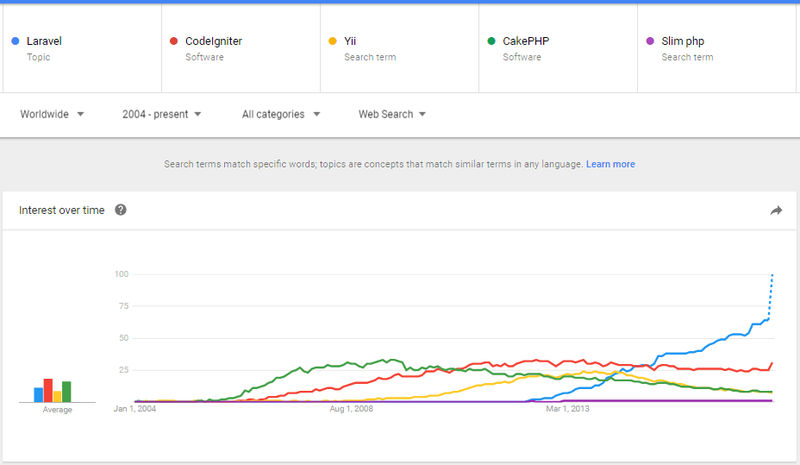 CakePHP is a strong choice in light of above discussion against CodeIgniter or Yii. However, CakePHP resembles Laravel too and for clients an cost-beneficial choice behind Laravel for PHP web development. Why Experts Prefer CakePHP for Web Development!